It’s an odd thing, but people tend to draw one way or another; and it’s generally what they call their “style”. I don’t see it that way, as styles can be changed, because all it is, is the consistent way you chose to render things. Alex Raymond (Flash Gordon) had one style, and Charles Schulz (Peanuts) had a drastically different one; but they both drew people and places within the context of their strips. If you can picture what the work of these two artists look like in your head, then realize the visual variations between the two come from (drastically) different styles. I’ve been trying to break the habit of always working in a realistic format, when out sketching people. It’s been a bigger challenge than I expected to break the habit of always trying to make what I see in real life, look that way on paper. It’s as if I feel I’m wasting the opportunity to perfect something, as opposed to taking the chance to experiment, and view things in a different way. 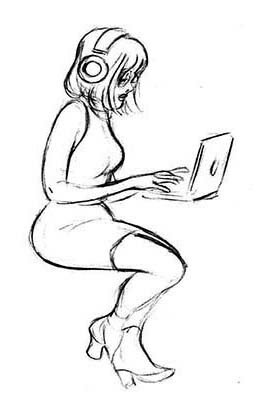 Here are a couple of recent efforts at drawing a woman working on her laptop at the local coffee shop, but in a more animated “style”. 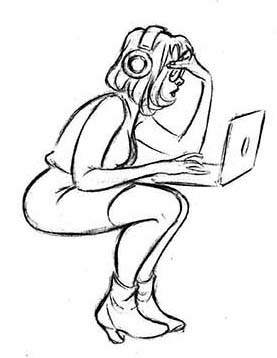 Second effort, but she was crouched over, while trying to see her screen with the sun shining in her eyes.